GoUpstate.com: Get The Skinny On Tippin From The Mrs.
Get The Skinny On Tippin From The Mrs.
Who knows a man better than his wife? 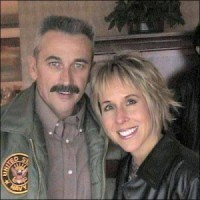 So while Aaron Tippin is out on the road on tour and working on his new television show, "Made in America," for the Great American Country network, we talked to his wife, Thea, to update us on his career. Thea has been married to Aaron since July 15, 1995. They have two sons, Teddy and Thomas. Tippin has a daughter, Charla, from a previous marriage. He is touring in support of his last CD, "Stars & Stripes," which was released September 2002. His concert Saturday night at the Spartanburg Memorial Auditorium is a benefit for the Piedmont Chapter of the American Red Cross. The CD's title track, "Where the Stars and Stripes and the Eagle Fly," reached No. 2 on the Billboard Charts. Proceeds from the single were distributed to the American Red Cross to distribute to the victims of Sept. 11. Blue Ridge native Tippin, whose hits singles include "You've Got to Stand for Something," "There Ain't Nothin' Wrong With the Radio," "Working Man's Ph.D," "That's as Close as I'll Get to Loving You" and "Kiss This," will start work on a new album this summer. He is hoping to release it early next year. "We are shooting for 90 tour dates this year," Thea said. "We really miss him when he's out on the road. The kids wake up and go, 'Where's Daddy?' "
Question: Tell me about Aaron's new TV show? Answer: " 'Made in America' premiered last night all over the country. He did this piece on Southwest Airlines. He goes from the baggage handlers to the pilots. It's all about American-made companies. He has been working on stories on Jack Daniel's, NASCAR and Bob Timberlake Furniture. He got to ride in a space shuttle simulator. It's about American companies doing well and how they are run. In between his tour dates, he's trying to get these shows shot." Q: Why was he chosen as a host? A: "He fits their network. He's a great American and stands for America. They did a special on his trip to Afghanistan in November. He's a natural at hosting the show. He doesn't have a script. He's comical. They say he's a real natural." Q: You mentioned a new album. Is Aaron already writing songs or are you going to wait until he gets off the road? A: "We have these writing appointments where we write together quite a bit. We write about what's going on in our lives or ideas that pop up in regular conversation -- something that strikes a chord. I have a book where I write ideas and we go down the list of ideas. When you write, you always draw on your experiences. That wasn't the case with the song 'Kiss This.' It was just one of those fun, in-your-face kinds of songs." Q: Does the family still travel together on the road? A: "We're going to travel with him this summer, but Teddy is going to start kindergarten this fall. Summer is his busiest tour time anyway. The children go out quite a bit with him and they love it. Teddy went out for a three-week run last year. It was just he and daddy. I was thinking, 'what kind of stuff is he going to pick up out on the road?' "
Q: Aaron has a strong female fan base. A: "Yes, women are definitely fans. But little kids love him all the way to grandmas and grandpas because he's got a good wholesome message and he's a family man. There's no age limit." Q: Does he still work out a lot? A: "He's still in fabulous shape but he's got a shoulder injury he's nursing. He hasn't been able to work out which is frustrating to him." A: "I am the luckiest girl. He is the best father. It was wonderful when it was just the two of us, but now after having kids and watching how he is with his kids, that just enhances our relationship. It just makes me love him even more. He's always there when we need him. We get to enjoy our career and personal lives together. Other couples don't like to do that. But we've always worked work well together. I like being part of his career." Q: Any plans for any more children? A: "He'd like to have about 10 more. I'm 39 right now. I've got two little boys and they are wide open. I don't know at the moment. That remains to be seen." Q: Do you have a favorite Tippin song? A: "There's a bunch. The ones we write together mean a lot to me. They are special. One of the songs that is very moving is on the Christmas album -- 'He Said That He Was Jesus.' I would get choked up every time. It's a cool song. It's a special song and it's got a neat message." Q: What would you like Aaron's musical legacy to be? A: "Whenever you hear his music, it's how he thinks and how he feels. It's who he is. He hasn't changed. I've known him since he got his first record deal. He has never let celebrity go to his head. He's just a normal, nice guy. He's a wonderful person with a big heart. He's a patriot, a great American." Jose Franco can be reached at 562-7212 or jose.franco@shj.com. © 2003 The Spartanburg Herald-Journal, Spartanburg, SC.